Photo courtesy of Rabbi Brant Rosen. 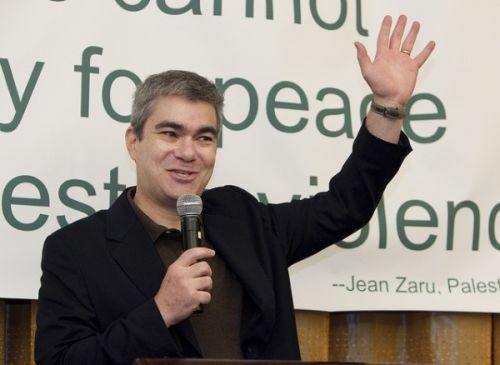 WASHINGTON, Dec 6 2012 (IPS) - Rabbi Brant Rosen leads a congregation in Evanston, Illinois and is author of the new book, Wrestling in the Daylight: A Rabbi’s Path to Palestinian Solidarity. *Rabbi Brant Rosen blogs at Shalom Rav. Why? What makes you think that Jews have an obligation to humor Anglicans, Episcopalians Methodists and Quakers’ ulterior religious motives? For their kindness? For their tolerance throughout the centuries? For the compassion they have always demonstrated for people who believe differently than they? Since when is pandering to militant “Christian” churches a Jewish value? Unless of course, the Reconstructionnist Rabbi is in effect a closet Christian waiting for the appropriate moment to come out. We have seen this behavior too often not to recognize the symptoms: demonization of Jews “as-Jews”, praise for the new masters “as-Jews”. Or as Baer aptly put it, “they had one foot in each door”. That those “Christians” would prefer Jews “slain” and “scattered” rather than in their homeland fulfilling their prophecies is common knowledge. Those “Christians” and their Jewish uncle Toms aren’t fooling anyone. They have boycotted and expelled Jews when there was no Israel in England in Spain in Switzerland in Germany etc etc.You should explain what makes this boycott different from all the other anti-Jewish boycotts in history?. Those “churches” were the callous organizations that have developed the religious rationale for South African Apartheid and are yet to apologize to those people. And where is their concern for their coreligionists in the Congo DR and Nigeria and Pakistan etc who are being slaughtered by the hundreds of thousands? No one is happy with the state of affairs in the Middle East. But any person of conscience should put their efforts in solutions negotiated peacefully, not support unilateral and arbitrary moves that are sure to condemn the people of the region to perpetual war and hatred that has already reached a point of no-return. And that goes for both sides. Rabbi Rosen is to be commended for his principled stand. He will be subjected to taunts, threats and abuse over his support for the BDS movement, but solidarity with the oppressed carries with it moral rewards which the mighty do not have the power to withhold. What does Auschwitz have to do with the creeping takeover of Palestine by Zionists that began in the 1890s? As an member of the IDF all you did was to contribute to this immoral creeping takeover.